CES is next week, so you may want to apply an internet filter for the terms “IoT” and “Internet of Things” if you don’t care for a world that is connected. With smartphone sales slowing and tablets and wearables not exactly blowing up the charts, companies are turning to your homes in hopes of finding the next big thing. This really started last year at CES where you couldn’t run faster from the word “IoT,” but it’ll be even more of a focus this year as IoT platforms are starting to evolve into actual products you can buy. 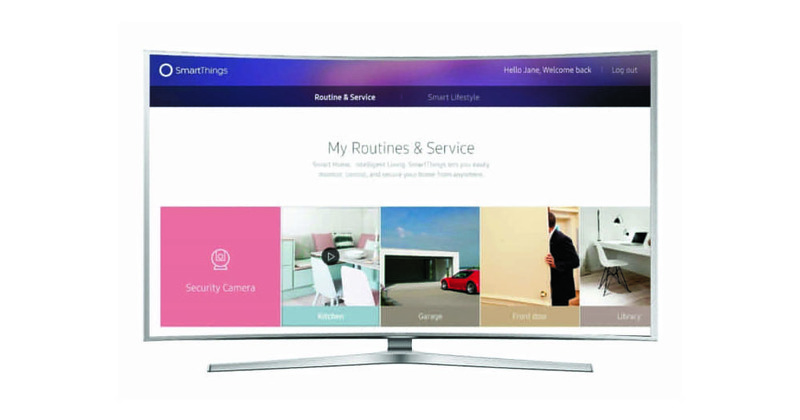 Samsung will be at the forefront of it all, thanks to their SmartThings line-up and new Smart TVs for 2016. Samsung announced today that all of their 2016 SUHD TVs will have IoT hub technology, which just means that the TV itself can act as the controller of your smart home. Of course, you’ll need to be invested in a smart home powered by Samsung’s SmartThings or SmartThings compatible devices, but that was to be expected. Samsung tosses around scenarios that could occur, like a person that you know approaches your home. Through your new Samsung Smart TV, you could see them coming via camera and then unlock the door. You could even receive pop-up notifications on your TV that relay motion detected outside from a sensor. If you are invested in Samsung, SmartThings, and are considering picking up one of their new 2016 TVs, your phone or tablet will no longer have to be the controlling hub of your home.